This Kichler Franceasi 1 light medium outdoor wall lantern in olde bronze finish with amber glass panels is rated IP44 and features classic style and old-world charm. Boasting a tall rectangular stepped wall bracket and medium lantern; featuring seeded amber glass panels overlaid with decorative panelling that is highlighted when the lamp bulb is illuminated. The Franceasi collection is inspired by castle windows throughout Europe, designed with a wide variety of tracery, mullions and stonework elements. The olde bronze panels were created with these wonderful windows in mind. The intricate details create delightful shadow patterns on adjoining wall surfaces and walkways through seedy amber tinted glass. If you are searching for quality outdoor lighting in a classic style, the Franceasi suite should be considered. Fully weatherproof and supplied with a manufacturer’s 3-year anti corrosion warranty, which relates to the corrosion of finishes on cast aluminium lights like this one. Locations within 5 miles of the coast are excluded. 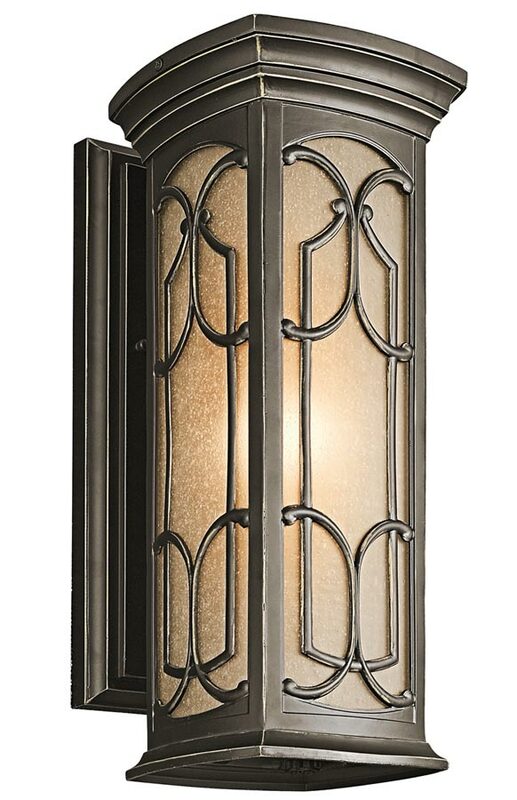 There are matching fittings available in this outdoor lighting range that include a small wall light and flush porch lantern; please see below for the complete range. This exterior light is supplied by Elstead Lighting and designed in the USA by Kichler who were founded in 1938. They design beautiful home lighting products featuring award-winning craftsmanship and unparalleled quality, such as the Franceasi 1 light medium outdoor wall lantern in olde bronze finish with amber glass panels and rated IP44 you see here.